Mars' 600-mile Marte Vallis channel system is filled with young lavas that obscure the source of the channels. This map shows Marte Vallis against the background of an elevation map of the planet, based on readings from the Mars Orbiter Laser Altimeter on NASA's Mars Global Surveyor. A 3-D reconstruction of structures beneath the surface of Mars shows the 600-mile-wide footprint of a mega-flood that carved deep channels into the planet within the past 500 million years, scientists say. Since that time, the evidence of the flood in a region known as Marte Vallis has been covered over by fresher lava flows. But a team of researchers pieced together the evidence by analyzing readings from a ground-penetrating radar instrument aboard NASA's Mars Reconnaissance Orbiter. The analysis was laid out Thursday on the journal Science's website. "Our findings show that the scale of erosion was previously underestimated, and that channel depth was at least twice that of previous approximations," lead author Gareth Morgan, a geologist at the Smithsonian Institution's Center for Earth and Planetary Studies, said in a news release. "The source of the floodwaters suggests they originated from a deep groundwater reservoir and may have been released by local tectonic or volcanic activity. This work demonstrates the importance of orbital sounding radar in understanding how water has shaped the surface of Mars." Over the past decade and a half, missions to Mars have provided ample evidence that the planet was once warmer and wetter than it is today. However, scientists say the most recent outflows of water came in brief, catastrophic bursts rather than as steady streams. The newly published research is consistent with that view. Morgan and his colleagues used the orbiter's Italian-built Shallow Radar sounder, or SHARAD, to put Mars' subsurface geology through the radar equivalent of a CT scan. They found that the boundaries between the layers of fresher lava and the underlying rock traced a network of buried channels. The patterns and depths of those channels were characteristic of the canyons that would be cut by flowing water. Lots of flowing water. The depth of the main channel was estimated at 226 to 371 feet (69 to 113 meters). "This is comparable with the depth of incision of the largest known megaflood on Earth, the Missoula floods, responsible for carving the Channeled Scabland of the northwestern United States," the researchers wrote. The Missoula floods occurred 12,000 to 18,000 years ago, due to a post-Ice Age warming trend, and discharged dammed-up water at a rate ranging up to 2.6 billion gallons per second. Morgan and his colleagues traced the Martian mega-flood to a radically different type of source: a fracture system in Mars' Cerberus Fossae region that apparently opened up to release water from miles beneath the Red Planet's surface. "It was a big crack in the ground, basically," Morgan told NBC News. A 3-D visualization shows the buried Marte Vallis channels. Marte Vallis consists of multiple perched channels formed around streamlined islands. These channels feed a deeper and wider main channel. The surface has been elevated and scaled by a factor of 1/100 for clarity. The area covered by this visualization is outlined by dotted lines in the global map above. NASA interns look down on Frenchman Springs Coulee in Washington state's Channeled Scablands. Researchers say the Martian mega-flood cut channels similar to those created thousands of years ago in the Channeled Scablands. SHARAD's depth readings suggest that the channels had to have been cut somewhere between 10 million and 500 million years ago. Morgan said that makes the mega-flood channels "much younger" than the geological features being studied by NASA's Curiosity rover in a different region of Mars. Curiosity's science team wants to find out whether Mars had liquid water and the other conditions conducive for life 3 billion years to 4 billion years ago. On the surface, at least, those conditions were long gone by the time the Cerberus Fossae mega-flood washed over Marte Vallis. Did life on Earth get started on Mars? 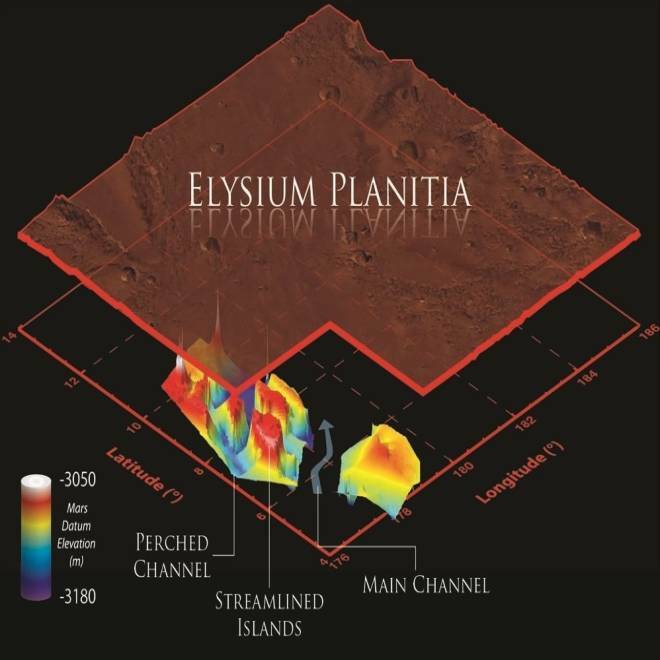 In addition to Morgan, the authors of "3D Reconstruction of the Source and Scale of Buried Young Flood Channels on Mars" include Bruce A. Campbell, Lynn M. Carter, Jeffrey J. Plaut and Roger J. Phillips.